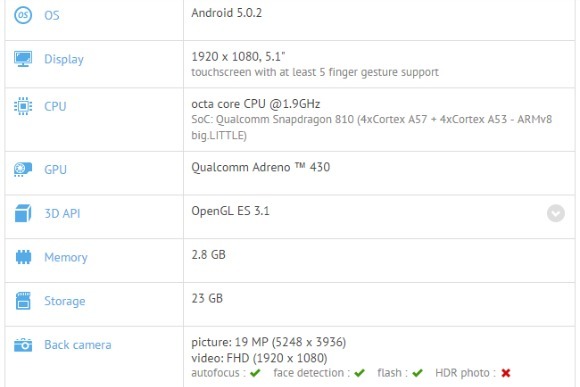 Earlier today we saw the LG G4 getting put through the paces of GFXBench, and thus having its most important specs revealed. And now it's apparently the turn of Sony's upcoming Xperia Z4. This device was spotted in the same benchmark's database, which is clearly a sign that someone at Sony is already busy testing it. And like all such benchmark results, this one too gives us a pretty complete list of specs for the device. The Xperia Z4 will sport Qualcomm's Snapdragon 810 chipset, unlike the aforementioned LG G4 which will apparently employ a Snapdragon 808. Sony's Z4 should also have a 5.1-inch 1080p touchscreen, 3GB of RAM, 32GB of built-in storage, a 20 MP rear camera with LED flash, a 5 MP front snapper, Bluetooth, GPS, NFC, and Wi-Fi. It currently runs Android 5.0.2 Lollipop. All of this information comes from the GFXBench data for the Sony E6553, which we assume to be the Xperia Z4 because it would make sense given Sony's naming convention. The letter in the model number changes each year, so for 2014 it was D, and Sony's first flagship of last year (the Z2) had the model number D65xx, while the Z3 was D66xx. Since the Z4 will be the first (and possibly only) top of the line handset from the company this year, an E65xx designation seems extremely likely.